God offers grace and mercy to all who ask. He doesn’t focus on our pasts any more than he focused on what some would consider His den of thieves. He transformed Paul and all of His disciples in His likeness. He is still in the transformation game. He transforms all of us, everyone who is reading this post, and those who are still seeking and reading this post, have been or can be transformed into His likeness and become a part of His family. Read Acts 9: 1-17. I read two transformation stories today. One about a former drug dealer and felon who had his felony expunged, ran for public office and was elected to the Leavenworth City Commissioner and is now the Mayor of Leavenworth, Kansas, USA, and a story that represents many transformations aired on Goalcast. We should never condemn ourselves or others to a life of failure or our sins. God is our Savior and has opened His arms awaiting our return; we are the Prodigal Son. Why, because our birth took place in heaven. God gave us life and a plan for our lives. When we were born into our human family, this gift came with us. We were given free-will, and we chose our path, which often is exclusively God’s Plan for our lives. We wander like the (Parable of the )Prodigal Son. God will always take us back if we ask for His forgiveness. “When he came to his senses, he said, ‘How many of my father’s hired servants have food to spare, and here I am starving to death! I will set out and go back to my father and say to him: Father, I have sinned against heaven and against you. I am no longer worthy to be called your son; make me like one of your hired servants.’ So he got up and went to his father. “But while he was still a long way off, his father saw him and was filled with compassion for him; he ran to his son, threw his arms around him and kissed him. “The son said to him, ‘Father, I have sinned against heaven and against you. I am no longer worthy to be called your son.’ “But the father said to his servants, ‘Quick! Bring the best robe and put it on him. Put a ring on his finger and sandals on his feet. For this son of mine was dead and is alive again; he was lost and is found.’ So they began to celebrate. “Meanwhile, the older son was in the field. When he came near the house, he heard music and dancing. Life presents many obstacles but as long as we put God first, see out of His eyes, feel through His heart our failings and that of others no longer seem important, we begin to live in kindness, love, and peace. It is time to stop demonizing ourselves with self-talk, and others. Thank you for reading my Posts. God Bless! The entire law is fulfilled when you love your neighbor, not because you like them, or you agree with their behavior, but because they too are a child of God. when I was young we were taught to dislike/disagree/hate the behavior, not the person. Our carnality often dilutes our love for one another. This is the day the Lord has made. Let us br glad and rejoice in it. When we take up our cross, we agree to follow Christ and take on the burden of denying self for the sake of others. We vow to employ the characteristics of Christ over and above our own human desires. When we pick up the cross, we choose to spread the Good News through discussions, actions, and deeds. Read Galatians 5:22-23, Fruit of the Spirit. Our hope is embedded in our trusting the Word of God. Our Lord does not lie or withhold the promises He made to us. Stand fast and be patient. The blessing is coming in the form that will advance us into His kingdom. What do you see when you look at the image? The word anxiety seems to have center stage. Life often feels like this image, dark, anxious, and chaotic. That is how Satan wants us to feel. Gods word is fiighting to get through. The battle rages between Michael, Archangel, and Satan’s demons are fighting over the delivery of our blessings. The second images’ message prevails – God cares for us. What we see in the natural is not the battle won, but the prevailing war. Our inner eyes (sight through our heavenly eyes) see the victory. Claim victory over your life today! God sends warrior angels to protect us! Christ died on the Cross to give us the victory. I know that joy is mine. GOD CARES FOR US. HE WILL NEVER LEAVE US OR FORSAKE US. 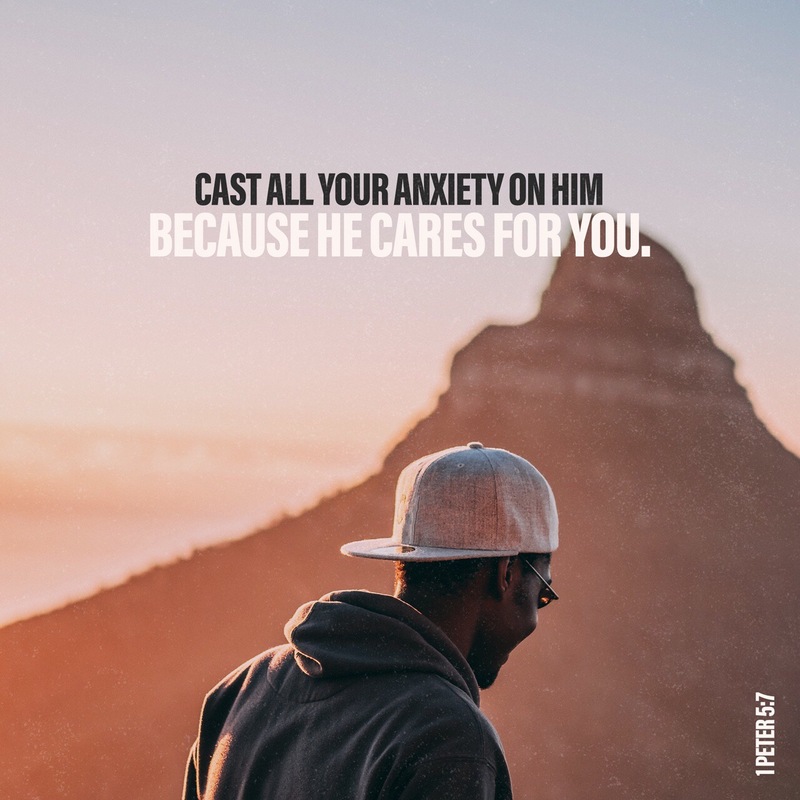 CAST ALL OF YOUR ANXIETIES ON HIM. Disclaimer – I used the first image to flush out this Post. I did not intend to offend its creator. 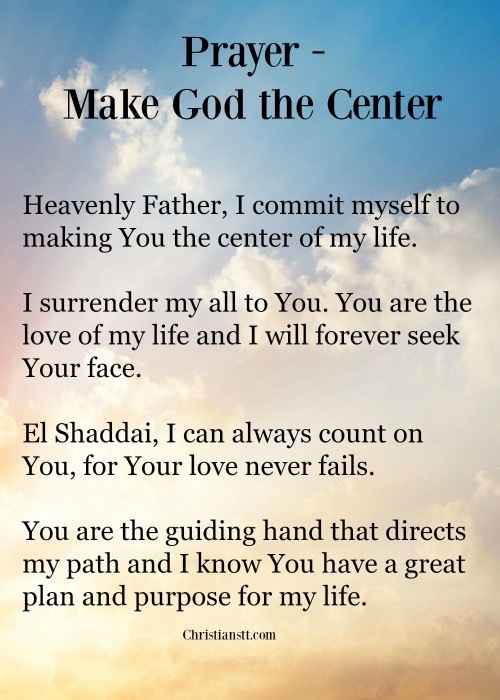 Thank you for visiting my Young Christian Warriors site and dailyinspiration-lisasthoughts.com.